The base system is just over two-feet long at 24.4 inches, while being 17.5-in high and 7.87-in wide. Moving outside ecosystems where 1.5 liter chassis exist, the 55 liter workstation is a behemoth by comparison. 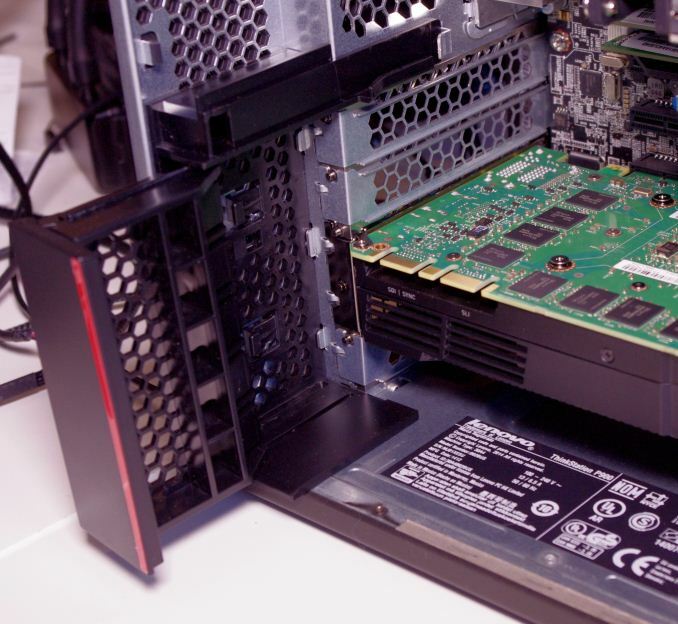 7.87 inches high converts to 4.5U for racks, perhaps indicating at what level Lenovo is positioning the P900. 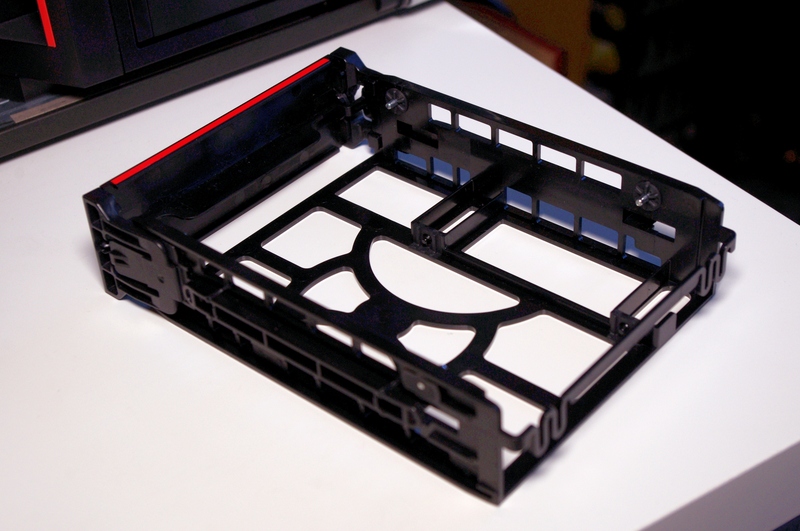 Carrying our workstation sample, even with only an M.2 SSD and one GPU was still an effort, with the chassis being made from a combination of steel for strength and aluminum for looks. 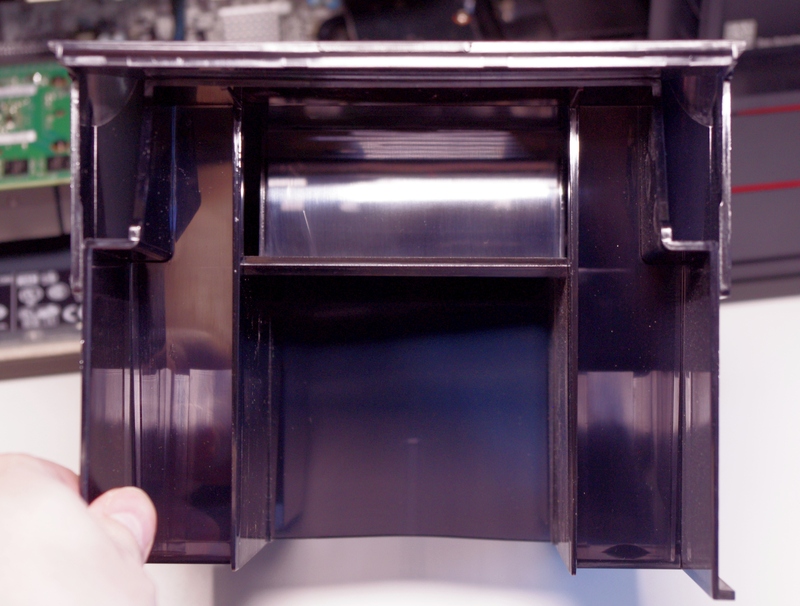 Opening the side panel via the latch shows of the internals. 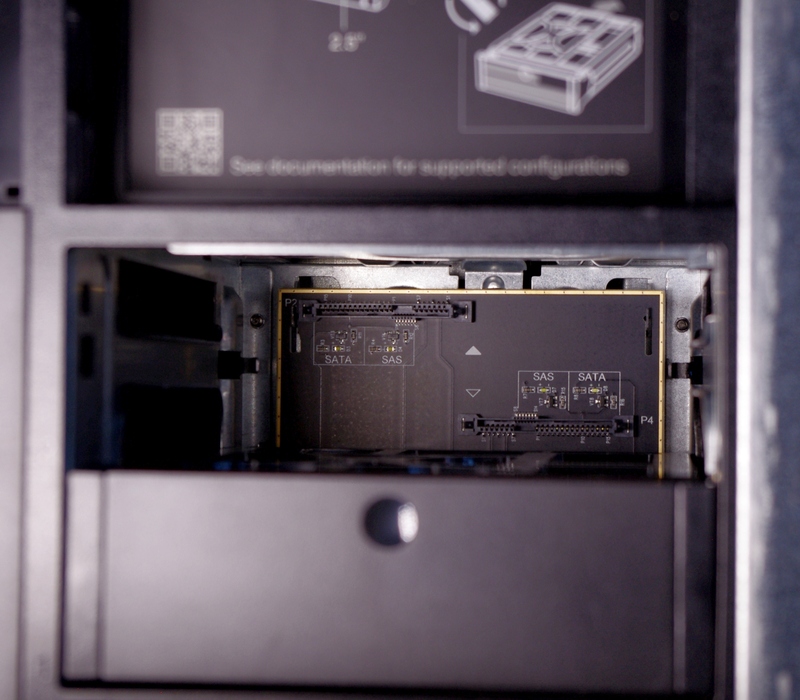 Similar to when we saw the initial renders of the P900, we get the three level split airflow in order to keep the system cool. 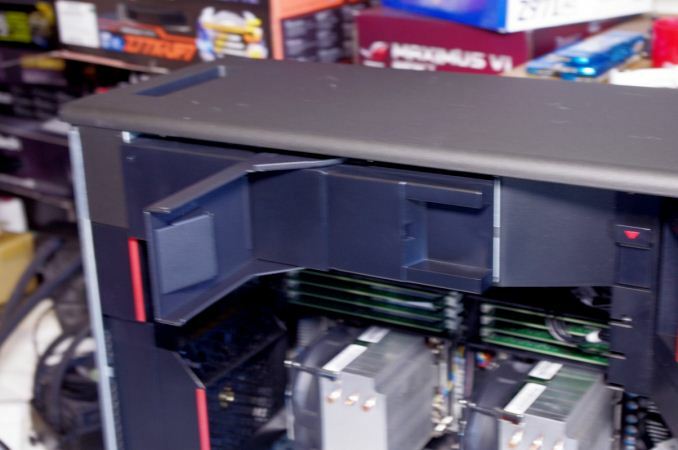 For the top and bottom, air comes in the front via the fans in the middle of the case, over the storage drives, and out the rear past the PCIe coprocessors. In the middle, the CPUs use a rear case fan to draw air in, split the airflow independently across the CPUs and DRAM, and then out the front of the case around the sides of the ODD bays. 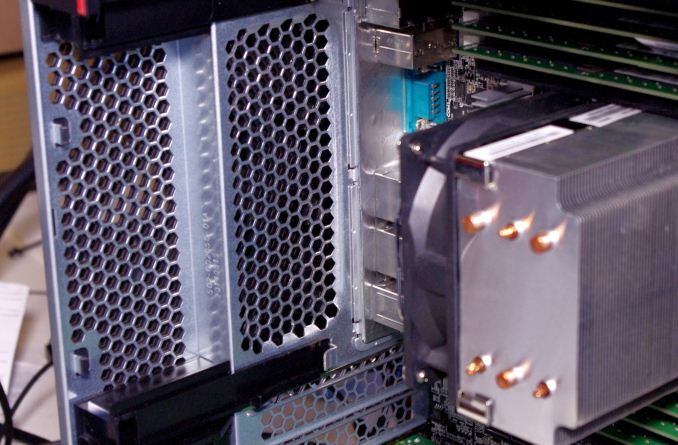 The air baffle for the CPUs is easy to take out via the handle provided. 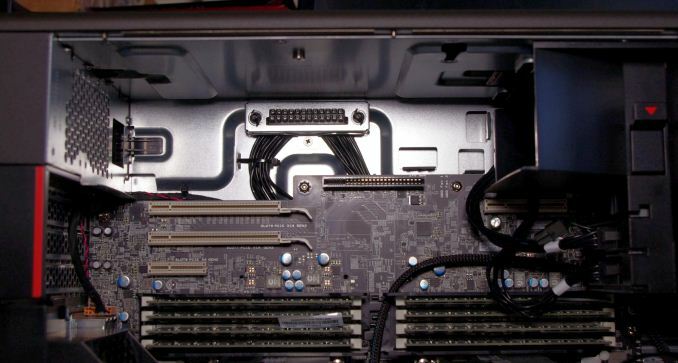 On the side of the handle, here shows the split for the top and bottom, with the air from the top going to the furthest CPU from the rear of the case. It is a little difficult to characterize in pictures, but the principle is sound. 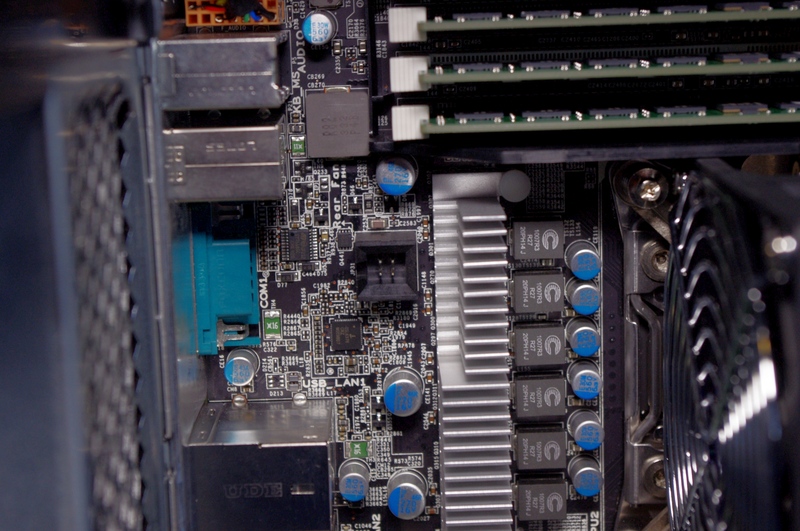 With the baffle removed the custom motherboard shows both CPUs in a linear design with four banks of DDR4 either side of each socket. Normally we see CPUs staggered to aid in design of the motherboard, but this application suits the Lenovo airflow management. Each CPU is served by a six-phase server-grade power design to ensure efficiency and longevity. These are Cooper-Bussmann chokes, similar to those used on some of the consumer grade motherboards tested which focus on server-level longevity. 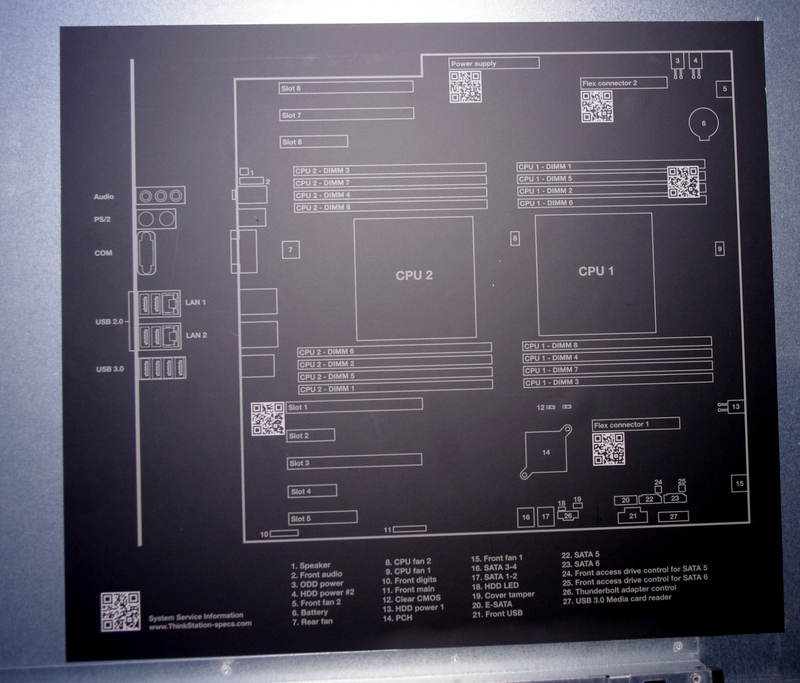 As there is no overclocking on this platform, there is little need to over-engineer this aspect of the design. There’s a hint of cable management coming through between the sockets due to extra cabling required at the bottom of the motherboard. 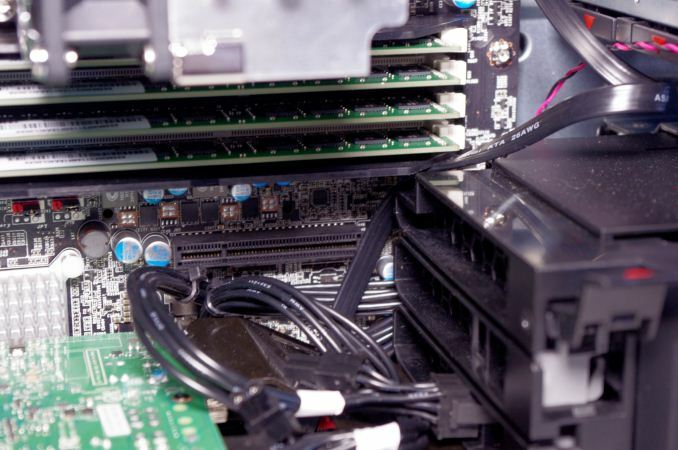 Lenovo has this fixed down as to not be effected by other components – the CPU fans are also equipped with fan guards so if the cable does come loose, it doesn’t start grating against the fan blades. 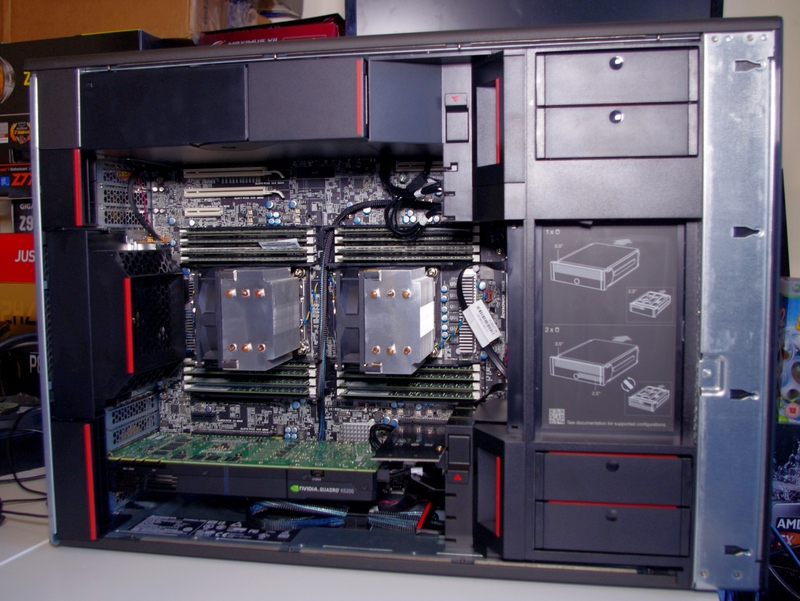 Installed in this system is the Quadro K5200 mentioned in the introduction. 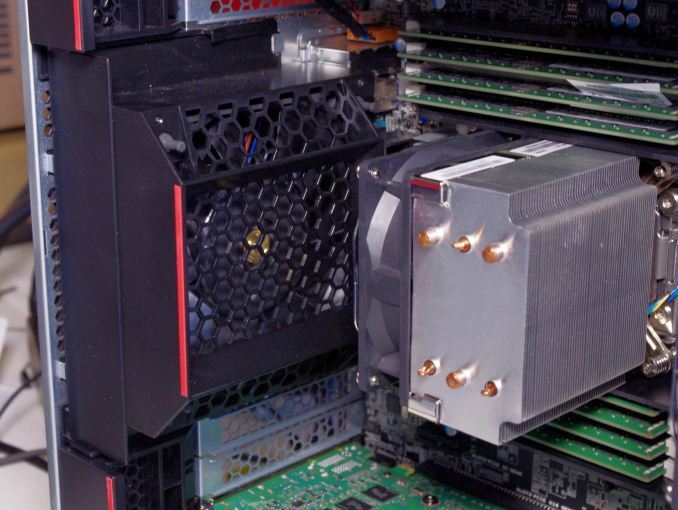 This is a standard NVIDIA blower design with no backplate and requiring double slot width. This card is using the lower down PCIe slot, but there is space just below the DRAM slots for another. 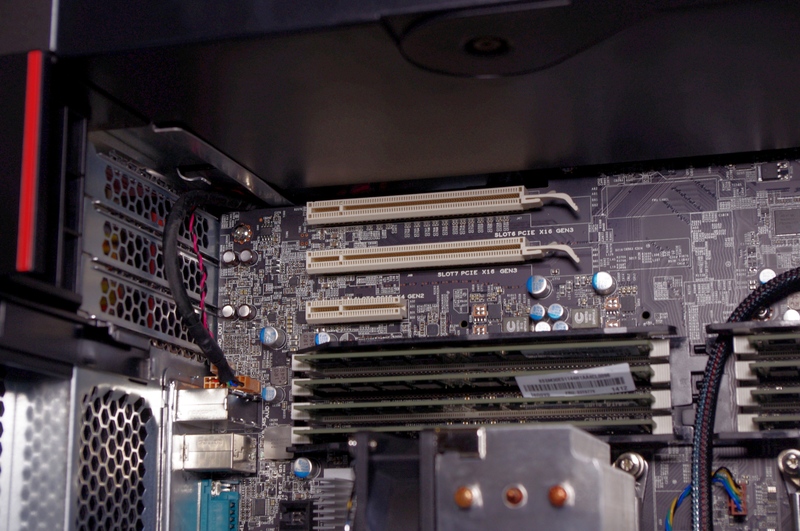 If this was installed in that position, the position of the PCIe cables would affect the FLEX module installed on the right. It splits into two PCIe 3.0 x4 M.2 slots, although Lenovo can provide a range of FLEX modules to suit the customer requirements. 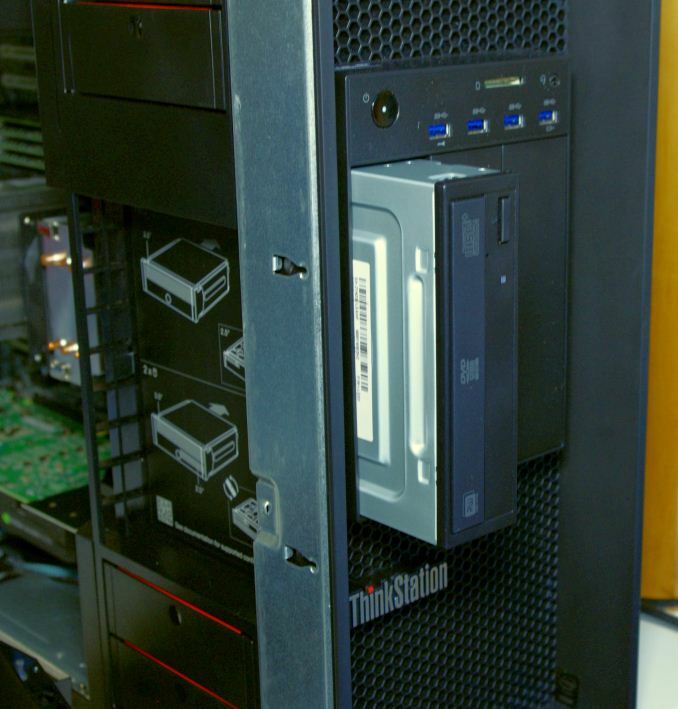 To be honest, this is a nice way of putting in storage, especially for OS and fixed drives, into a high end workstation like system. 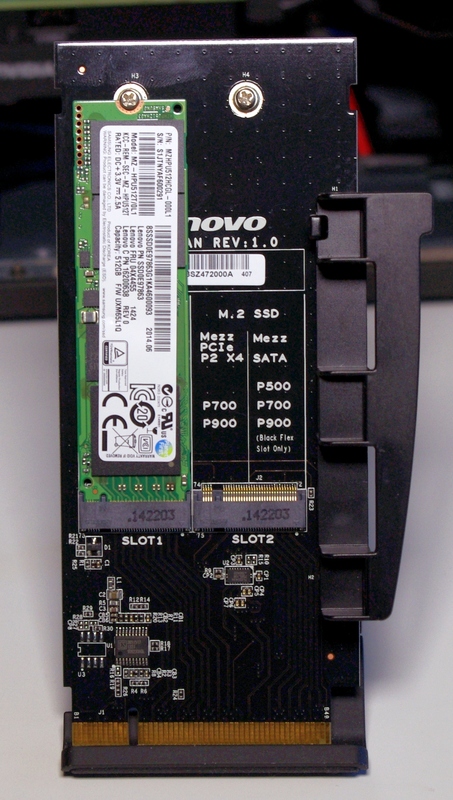 The drive supplied in our system was the 512GB model of the XP941 from Samsung, rebranded slightly with Lenovo product codes in case of replacement. Where the FLEX module sits in the motherboard actually covers some of the cabling underneath, but putting the module back into place was easy due to the chassis design. Next to this is one of the system fans. 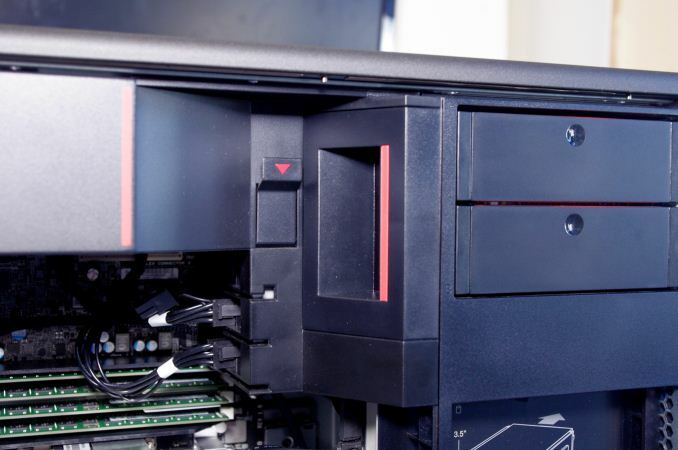 Rather than be placed right in the front of the chassis blowing air from the front to rear, these sit in the middle between the storage drives and the PCIe coprocessors and can be removed very easily by pulling the handle at the red stripe. The fans are guarded on the open side and use Lenovo’s interesting fan connector in order to slot in. No screws are required. 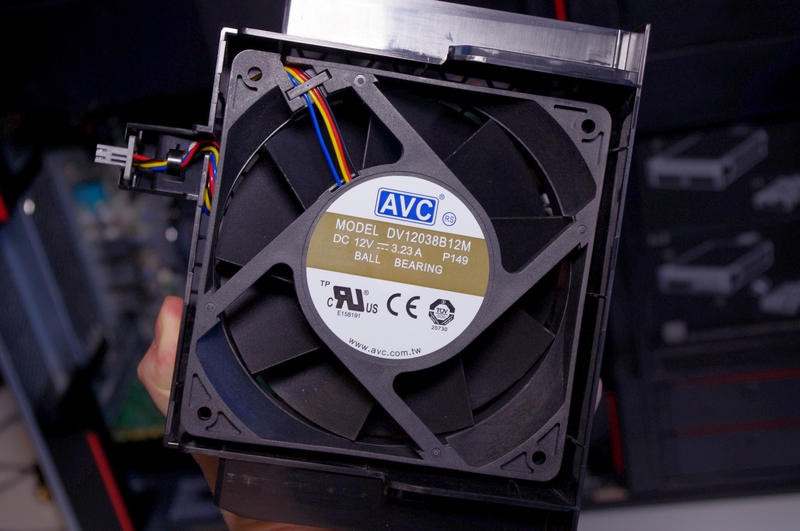 The fan used here is an AVC DBTA0938B2U, a 92x92x38mm fan which can use a fair amount of power at full load. Even with the side panel off I never heard the fan move above a low hum, even when hammering the system. That being said, this fan has to be able to cope with a fully laden system in a hot climate which might initiate a higher speed profile. 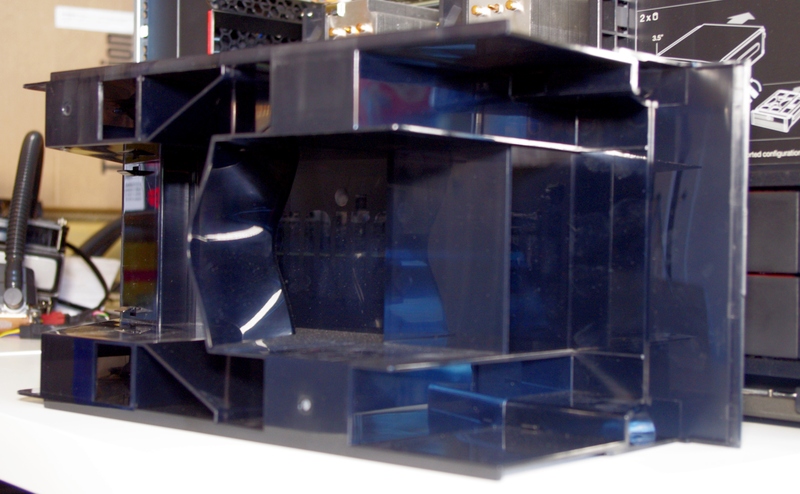 Similarly, the top strip has an identical fan as well as space for another FLEX module. At the top we find the 1300W power supply, removable in one action by lifting the lever with the red strip. Before we get to the power supply itself, this is how it connects directly into the system. 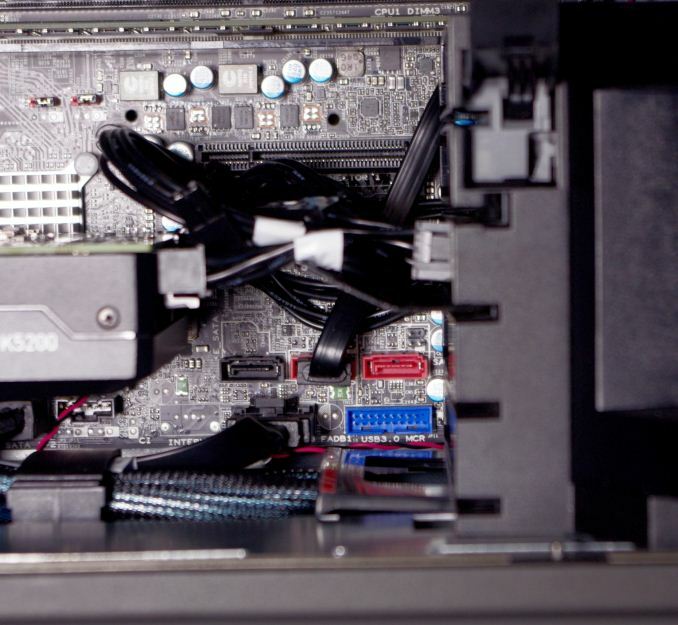 We have a direct line in on the motherboard which looks like (but isn’t) a PCIe slot as well as a series of headers screwed into the case for external connectors. 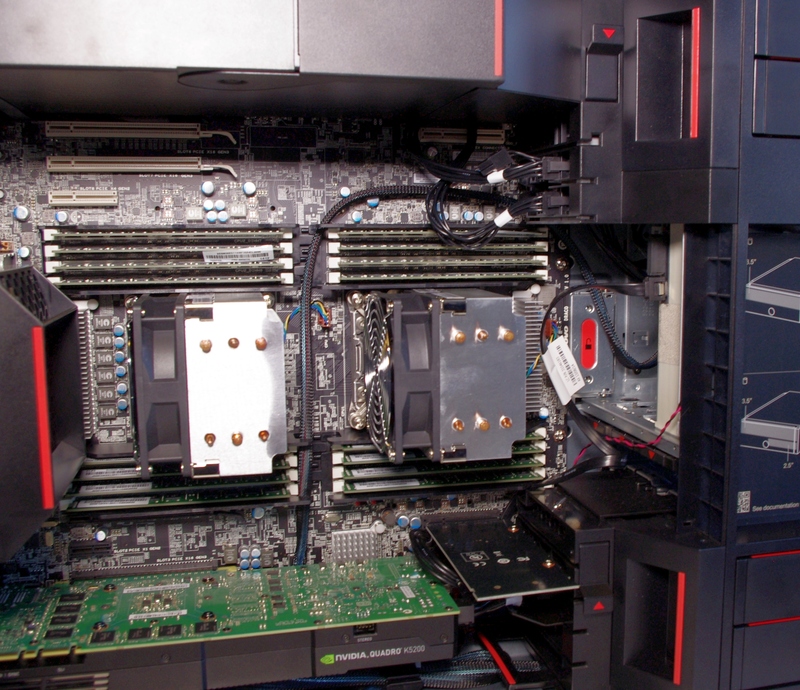 Through these two inputs/outputs, the system power needs of the components (motherboard, CPUs, drives, PCI coprocessors) are handled. The connectors on the power supply also look deceptively like a 20+4 pin power connector and a PCIe port. 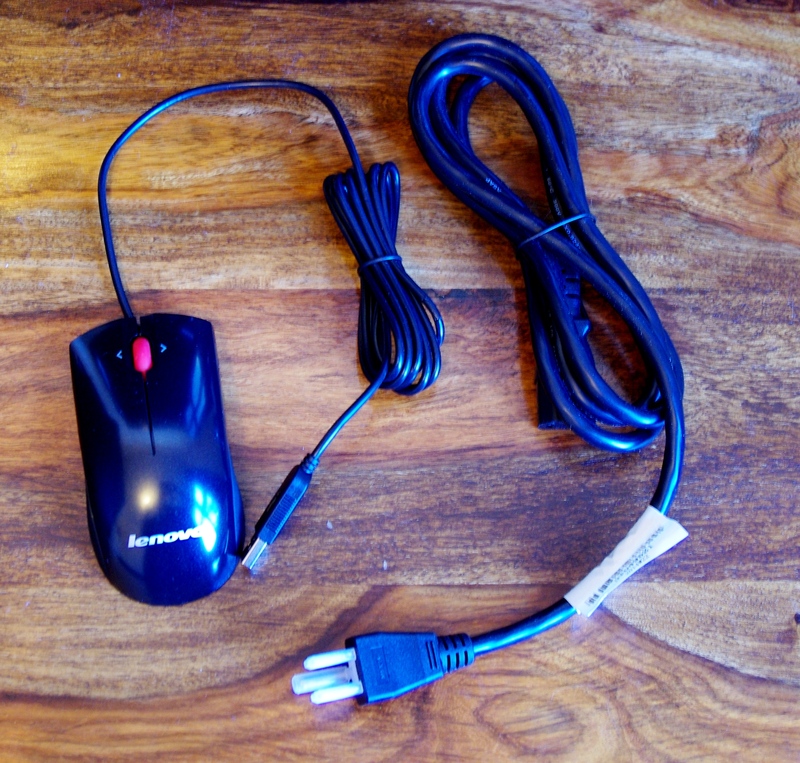 To the user on the outside it looks very simple, with a single 3-pin lead requirement. The power supply also supports a power self-test mode, presumably indicated by the green and amber lights beside the power socket. The two fans at the rear of the power supply in the case ensure that airflow is from front to back based on the units orientation. The sticker on the top indicates that this power supply is a Delta Electronics unit that satisfies the 80 PLUS Platinum standard, giving 90-92-89 percent efficiency at 115V and 90-94-91 percent at 230V (based on 20-50-100 percent loading). 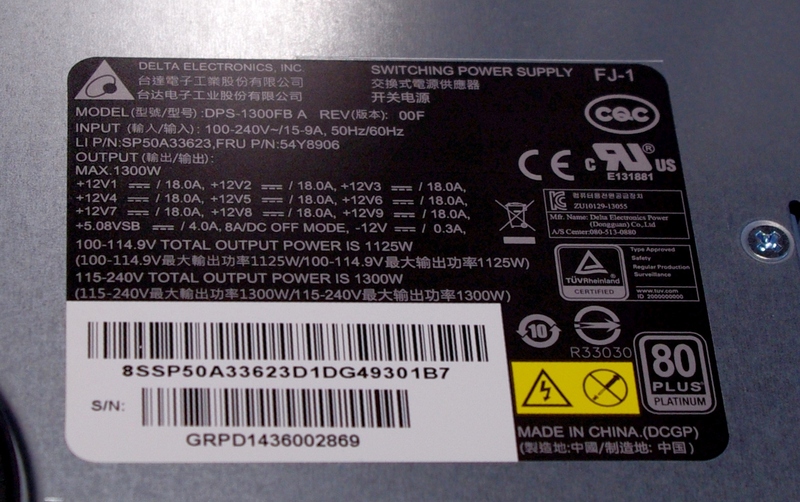 Interestingly the way this sticker is written seems that the power supply has a total of nine voltage rails, each limited to 18A. 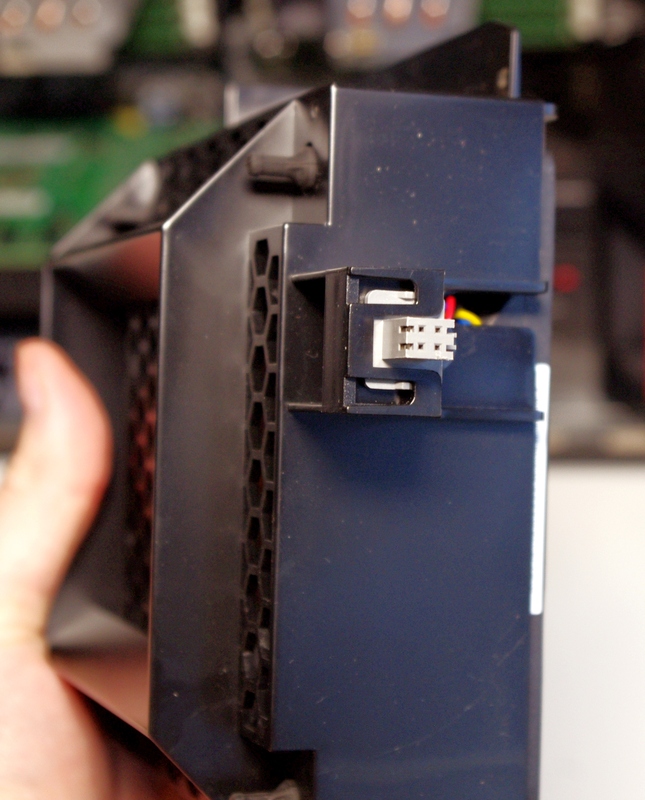 But the reason to take it out is to get a better look at the connector Lenovo is using for these fans. Which is rather bulky and we won’t see it on anything designed to be commercial any time soon. 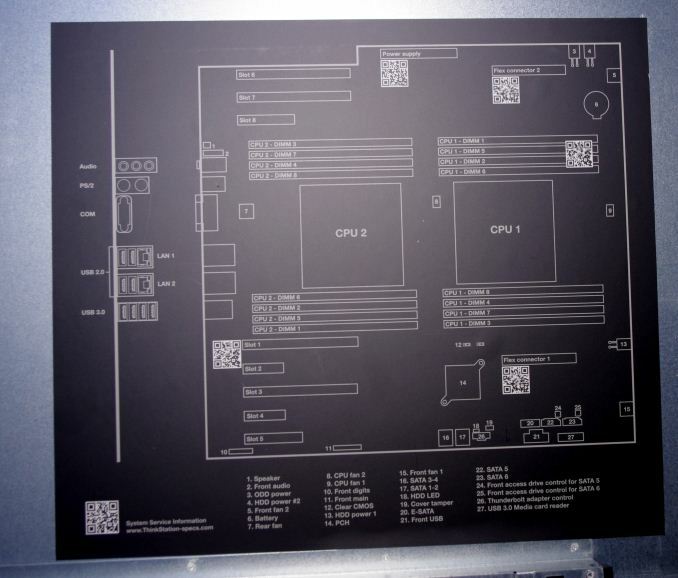 As Lenovo is designing the whole system, they can almost afford to be liberal with PCB area. 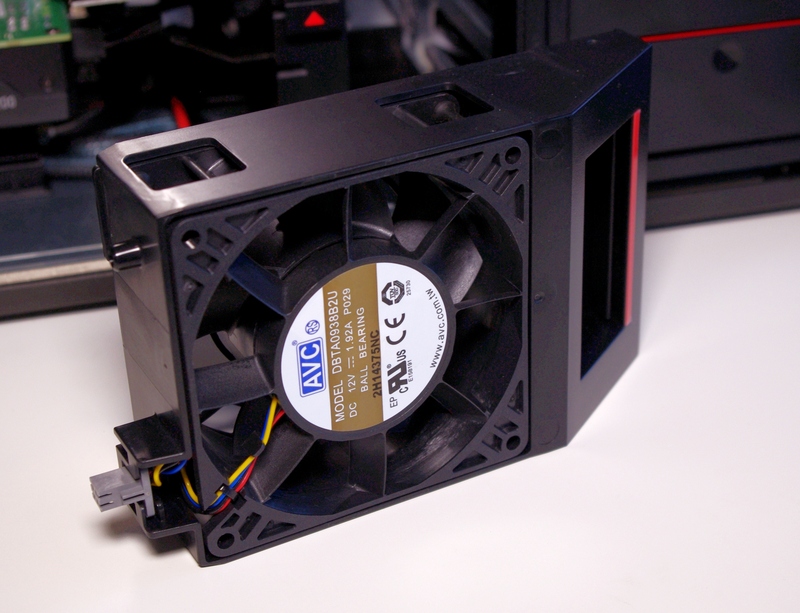 It is also worth noting that the power delivery cooling heatsink has a small cut-away in order to fit the fan. The rear fan supplying the processors with cooler air is an AVC DV12038B12M, a 12cm ball bearing design to which there is very little information online. Similarly at the top, although only three PCIe slots are present here allowing for a big co-processor and a smaller connectivity card. 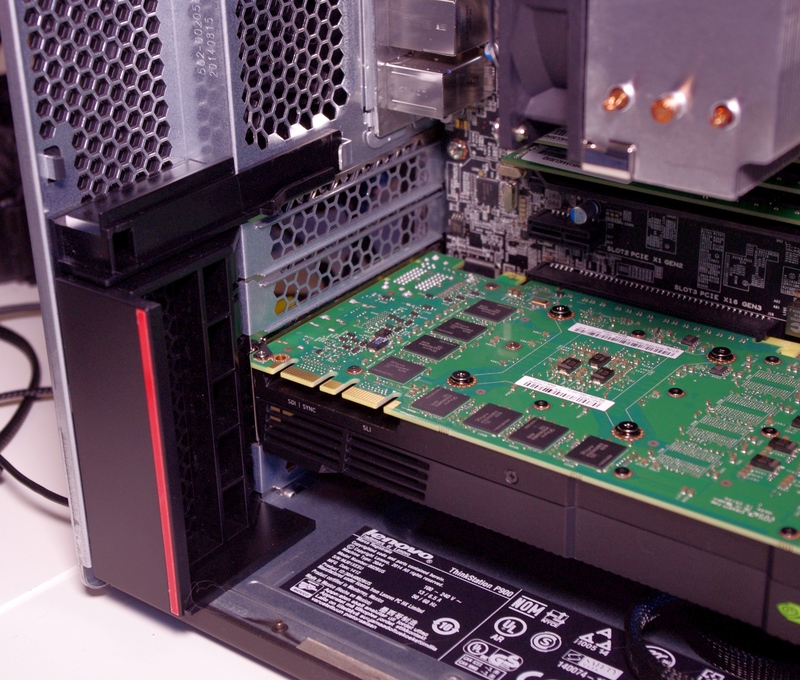 The PCIe 2.0 x4 slot is open ended, allowing for bigger cards at reduced bandwidth. On the other side of the chassis are the ODD bays. 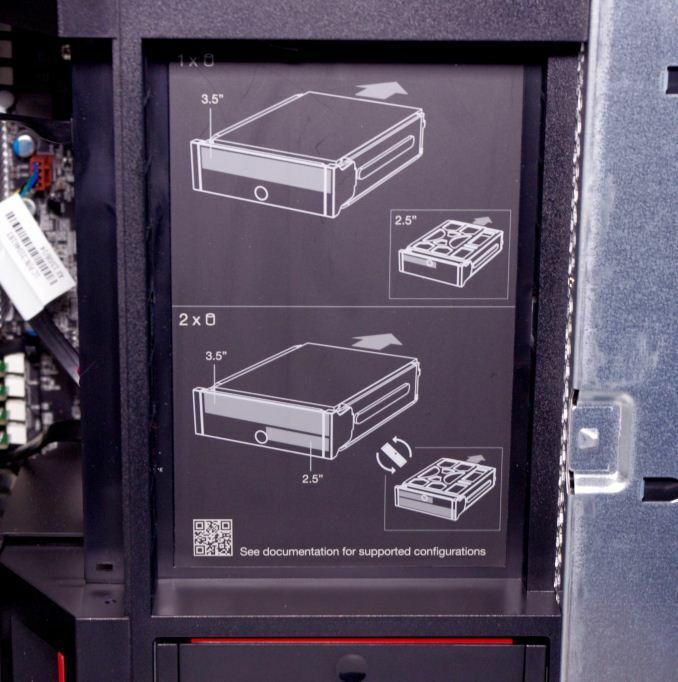 There are three possible, with one of our sample loaded with a DVD/RW drive. Rather than going for slim bays, these are full on allowing for other devices that require the room. 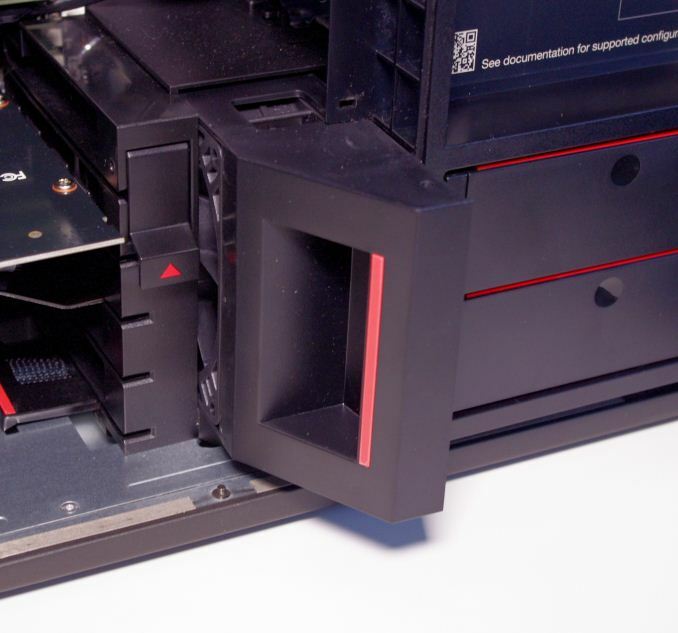 The drives can be removed by pulling on the tag with the red arrow below the drive. This allows for a 3.5-inch, a 2.5-inch or a combination to be used per bracket. These brackets have their own SATA and power connections already pre-attached, allowing them to be installed quite easily. The box contents for the P900 match those for the P300 – at a basic level we get a bundled mouse, keyboard, power cord and operating system/recover disks. Because Lenovo provides the systems as ‘Windows 8.1 downgraded to Windows 7’, it means the price of our sample comes with 8.1 should the user want it, but it ships with Windows 7 as the operating system at boot. Going back up to Windows 8.1, or a fresh install, requires these disks. "these are the high TDP 160W models with 12 cores"
Indeed, it should say 10, which is ironic as it's correctly described in the spec list that follows. 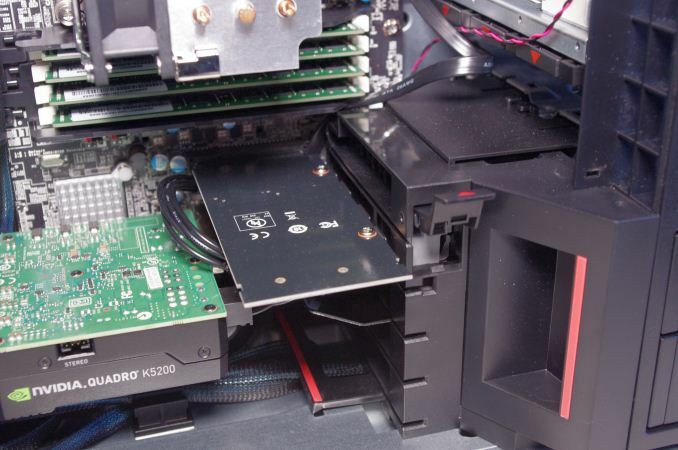 My biggest complaint with systems like these is the lack of any backup drive of some kind for the C-drive; IMO this should be standard on all pro systems by now. I've helped with so many pro users over the years who've had normal rust spinners fail, at least with those there's usually a chance to rescue data before a drive completely dies, but with SSDs, normally no chance. 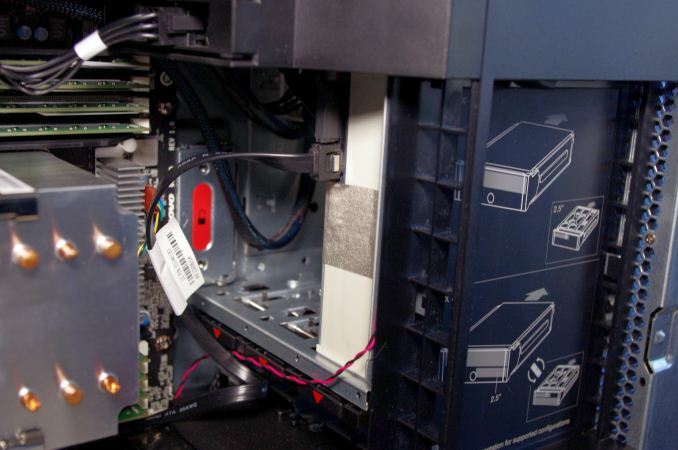 IBM could at least include a simple MX100 or something for C-drive backup. Let's face facts with facts...quality has declined since IBM turned over their PC division. Most Thinkpads are built to 'Ideapad' quality and engineering now, and in the case of the Thinkpad E, it IS an Ideapad. There isn't anything specifically "wrong" with Ideapads, but they don't live up to the Thinkpad reputation. 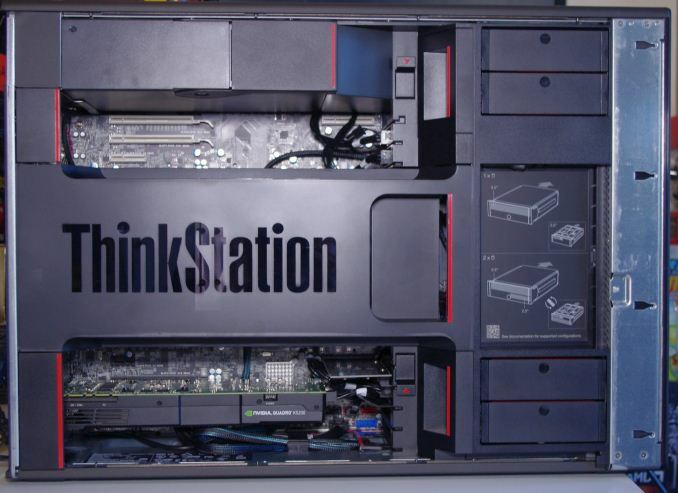 None of the new Thinkpads do. Lenovo is also notorious for not standing behind their products, EOL'ing products quickly after a successor is released. The last great Thinkpad's were the T4x/X40 series. 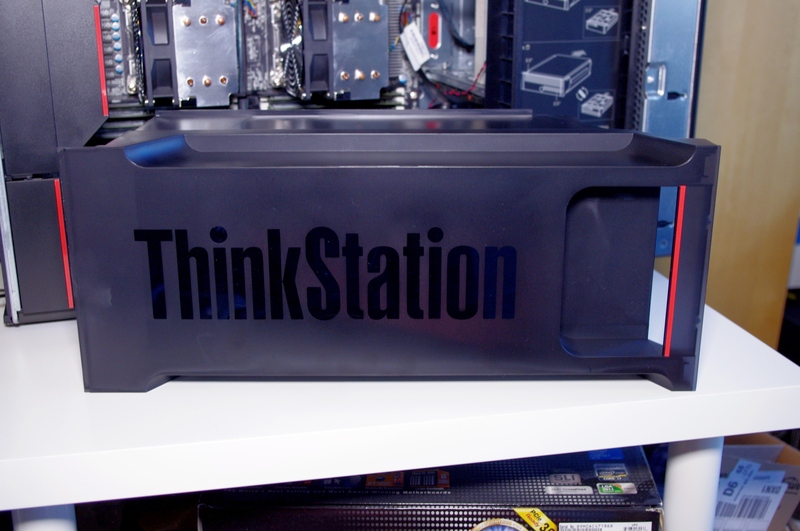 Lenovo quickly ruined the T60 series with inadequate cooling for the discrete GPU's, leaving it up to the once-devoted Thinkpad community to create the utility TPfancontrol to fix the fan ramp-up issues. Issues persisted from there, with poor quality lithium cells and poor quality plastic ports ever since. Just Google T400/T500 USB ports cracking.